We've recently seen some mightily impressive robotics from Japan's Kawada that might one day put us all on the job market. 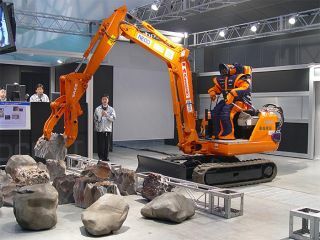 But a recent exhibition saw the firm showcase the next level of mechanised workman in a robot that can operate heavy machinery. The HRP-1S is not a new robot and, as photos show, is clearly related to Honda's Asimo somehow, although its new ability to dig holes is a leap forward. In the demonstration, HRP-1S operates an earth-removal machine not by itself but via a remote-control link to a human operator in a control centre. Kawada anticipates that such a set-up could prove useful in dangerous situations. It points out that using a multi-purpose robot to control various machines is simpler than creating dozens of different pieces of equipment that can be remotely operated. The jumpsuit-wearing 'droid can be seen going through its paces here at the intriguing Pylojump website , which is dedicated to robots capable of jumping - really.